Welcome to my Microsoft Tips & Tricks section. In this session I will describe how I setup the Time Service settings in my domain/forest. Time in a Microsoft Windows domain and forest is incredibly important. If time on domain controllers begin to drift off, problems aren’t far away. Why Microsoft haven’t added this check to their Best Practice Analyzer is strange to me. This is one of the first things I check whenever I am troubleshooting Active Directory-related problems. I also do a check of Windows Time Service functionality before I start any new implementations of VMware Horizon View, as a good working time source in a domain and forest is critical. I will cover my VMware Horizon View setup in a later post. As we can see here, the server AD-01.ad.admin.frelab.net has the PDC role in my domain. 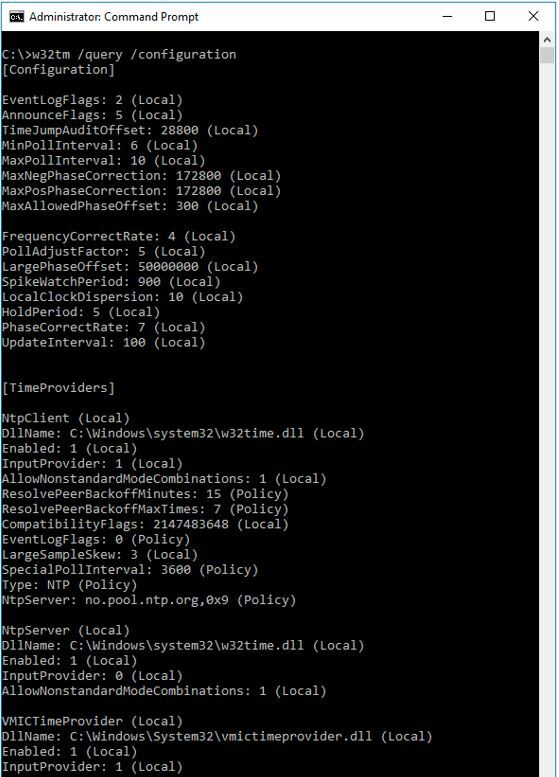 If I now check my Event Viewer, I will also see that Windows Time Service is syncing nicely with my external NTP-server and is advertising as a good time source in my domain. When I now check time source using the command “w32tm /query /source”, I see that this dc is syncing with my pdc. The Event Viewer confirms the correct sync. With these small steps, I can now be guaranteed a smooth working Time Service in my domain and forest. No problems with replication or other Active Directory issues can now be related to malfunctioning or misconfigured Windows Time Service.